Happiest of Mondays to you! What a crazy weekend it was; stay tuned because Wednesday, you’ll get a sneak peek of what my friends and I were up to this weekend. So fun! Now that Monday is here, though, I’m in the mood for an easy, breezy haircare routine I don’t have to think twice about. 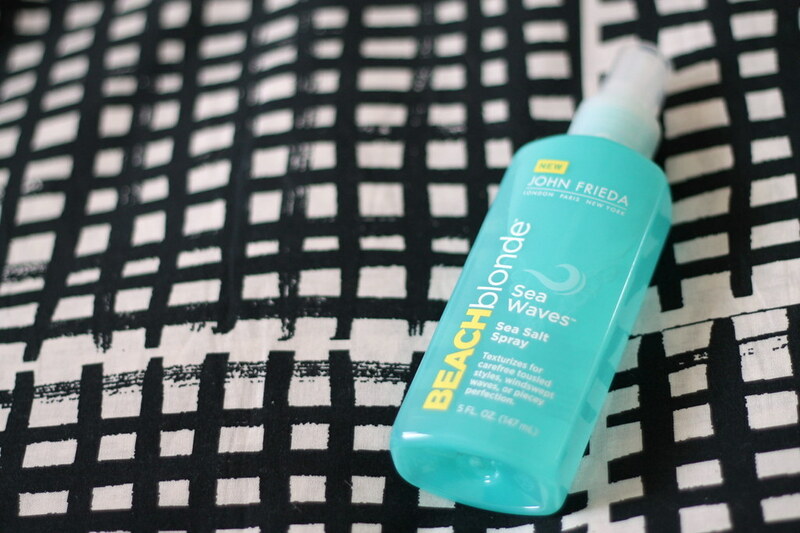 Enter John Frieda’s Beach Blonde Sea Waves Sea Salt Spray. If you’re like me, you’ll remember using this product in middle school; it was a cult favorite, but it was taken off the market. Now it’s back, and it’s just as good as I remember. Not only does it smell like summer, but the sea salt deposits just the right amount of texture in my hair. For me as a curly-haired girl, the summers can be tough on my hair, especially the humidity. It doesn’t exactly fight frizz, but it somehow manages to make the frizz look natural and beach-y. The sea salt spray is a shower-spray-and-air-dry life-saver.